Beef liver is a very useful product. It is rich in vitamins, amino acids and trace elements that stimulate the brain, increase level of hemoglobin in the blood. In the liver low in fat, therefore a threat to the slim figure she is not. Plus, the liver has a great taste, especially if to cook it tender and soft. Rinse thoroughly with fresh liver cold water. If you took the liver out of the freezer, wash it, but do not defrost until the end. So it will be easier to cut. Clear the liver from the films. Cut it into slices about 1 cm thick and place in prepared dish. Break an egg into a glass of milk and stir with a fork. Pour the chopped liver with the mixture. Steep the liver within 1 hour. Clean the onions from the husk and cut into half rings. Then sauté it in a separate small frying pan until Golden brown. While fried onions, heat the sunflower refined oil in a large frying pan. Add the liver, which are soaked in the mixture and start to fry from two parties. Fry on high heat for a short time, five minutes, otherwise the liver will become tough. While cooking, add a pinch of salt and pepper. Fried pieces of liver put in a pot in one layer. Over the first layer with sour cream and evenly put a little onions. Then put the next layer of the liver, sour cream and onions. Pour into the pan with the liver milk mixture with the egg, add a little boiled or filtered water so that the sauce covers the liver. Add salt to taste and simmer on medium heat for five minutes. 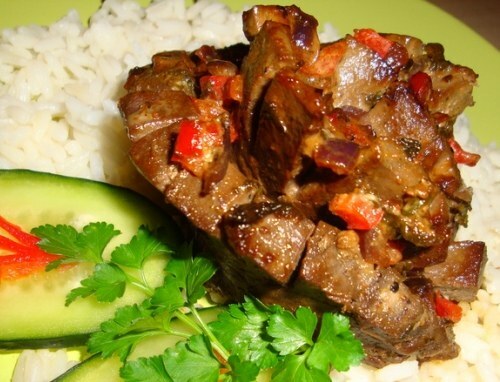 Following this recipe, you get delicious and soft liver. Buy always fresh steam the liver. If you do not plan to cook it on the same day, freeze yourself for a few days. To make the liver softer, also, before frying, roll each piece in flour or breadcrumbs. In this case, the liver will not have time to leak juice and she will become even more soft and tender. Feature beef liver is that it the characteristic tart taste. To neutralize experienced chefs before cooking is soaking in milk. However, despite this feature, beef liver can be cooked a variety of dishes that will appeal to you and your family. Probably the easiest and fastest way to cook beef liver is to fry it. To do this, prepare the liver: wash it, cut the peel from the edges and carefully remove the hard veins. Cut the liver small cubes and place into a pan with hot oil. Peel the onion and cut it in half rings. Several times, quickly flip the pieces of liver in the pan so that they are roasted from all sides. Place the sliced onions in the pan with the liver, add salt and spices to taste. 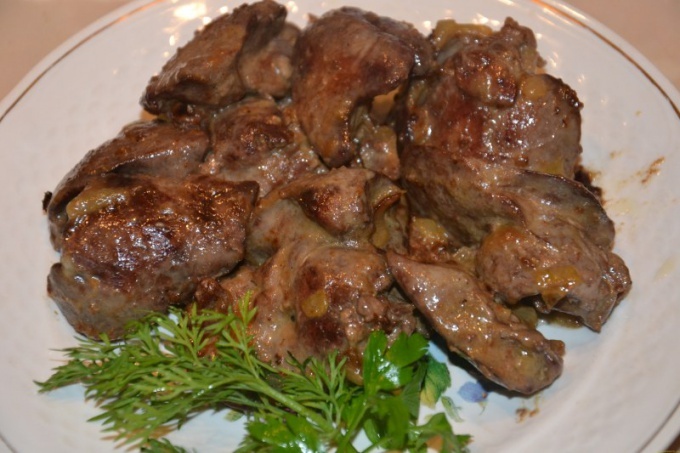 Fried liver goes well seasoning "Khmeli-suneli". Continue to fry the liver, constantly stirring the contents of the pan. The dish is ready when the onion warms up and becomes transparent and slightly soft. A little more time will have to spend on cooking braised liver. However, this dish can not be called complex. To cook prepare beef liver in the usual way: wash it, remove the thin skin and cut the vein. Onions cut into small cubes in order to ready the dish wasn't long onion fibers. Place on a heated pan with vegetable oil, onion and liver and lightly fry the mixture over high heat, regularly stirring. Add to the pan a couple of tablespoons of sour cream, salt and spices, what you like the best. Mix everything and cover the liver with water. Add the Bay leaf, loosely cover the pan with a lid and simmer until tender. Beef liver, you can make home-made pate for Breakfast. Wash the liver and remove large vessels. Cut the liver in big pieces, put in a deep frying pan with vegetable oil and lightly fry on both sides. Peel two or three large onions and cut them into quarters. Peel a large carrot or two medium and cut them crosswise into three or four parts. Put the vegetables in the pan with the liver, add seasoning to taste, salt and a little mayonnaise. Add to the pan of water and simmer for one hour. Cool the liver and vegetables, and then rotate all the contents of the pan through a meat grinder. Along with the liver turn one hundred grams of butter. Nice to add in the liver pate a little smoked bacon. Powdered mixture, mix with a mixer. The pate is ready. Incredibly healthy the liver – a great base for hearty dishes, especially during the spring beriberi. Want to diversify the usual menu and tasty to feed the whole family? 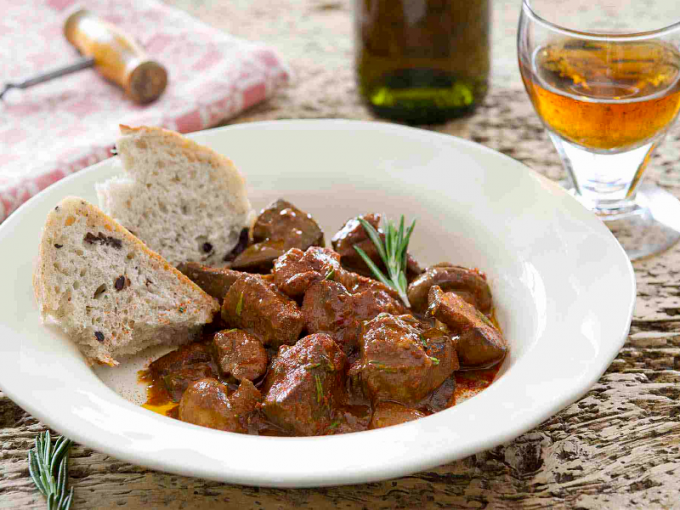 Prepare beef liver in a spicy tomato sauce or make an aromatic liverworts. Wash the beef liver, place it in a deep bowl or container and pour cold water so that it completely covers the meat by-product. Leave it on for 20 minutes, then slide onto a paper towel, dry, free from film and cut into small wedges. Will peel onion and garlic cloves, cut into thin half-rings of the first, second grate on a grater or crush in a special press. Dissolve in half a glass of water starch and stir so that no lumps. Whisk the soy sauce with a little warmed honey and tomato paste. Mix the liver with the garlic, pour starch liquid and marinade, stir and leave for 20-30 minutes. Heat the vegetable oil over medium heat and fry the onions until Golden. Remove the liver from the tomato-soy liquid with a slotted spoon and add to the pan. All simmer 3-4 minutes, stirring constantly with a wooden spatula, then pour in the marinade and half a Cup of hot water. Simmer the dish for 5 minutes, the sunflower it if necessary, and season with spices. Turn down the heat to low, close the pot with a lid and cook the liver for another 1-2 minutes. Remove it from heat and allow 5-7 minutes to infuse. Boil the buckwheat in salted water. Detach the liver from the backing and soak in milk for half an hour. Slice onions and carrots and fry in vegetable oil until soft. Skip the vegetable sauté along with chopped to pieces a by-product through a meat grinder or chop in a blender. Combine the minced meat with buckwheat, a good stir and salt to taste. Fat cut the mesh into squares of size 10 × 10 cm fold them in 1 tbsp of the hepatic mass as cabbage rolls. Convolution fry in vegetable oil until crisp. Put them in a pot or a small ovenproof form, pre-zastelil it with cabbage leaves. Pour in a bowl of boiling water to one third the height, close it with a lid or foil and place in a preheated 180oC oven for 20 minutes. 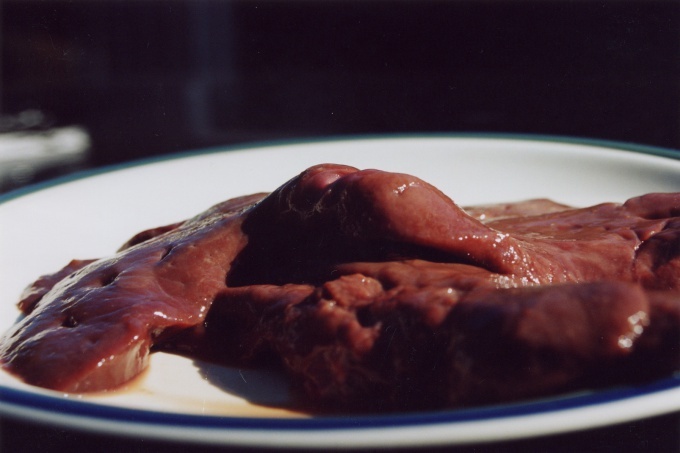 The liver is one of the most "naughty" foods that require thorough pre-treatment before cooking. If it is wrong to prepare liver for cooking delicious meals will not work – it will be too hard and dry. In addition, the finished dish can have quite a distinct odor, which can not hide no condiments. But if you properly handle the liver before frying, it will be tender and juicy. Like to your liver, it is very important to remove all its external covering film. If you do not remove them, the liver will work very hard. Frozen liver the film is removed quite easily. Put it in a bowl of hot water for a few minutes to top film a little thawed. Then pry it with a knife and remove the liver. If the product has not undergone freezing, before processing it is necessary to prepare: rinse the pre-washed piece of liver with boiling water, and then for 2-3 minutes dip in cold water. Using this simple procedure to remove the thin film of the liver will be much easier. Just incise film with a sharp knife and gently separate it with your fingers. After treatment, thoroughly flush the liver until it will not cease to stand out blood. Then it can be soaked in milk. Make it optional, but soaking will give the dish a more pleasant aroma and delicate flavor. Since liver contains bile ducts, it can taste bitter. Milk washes away the sediment of bile, eliminating the bitterness. Soak the liver in milk should be at least 30 minutes, and ideally the exposure time should be 2 hours. Select how you will fry the liver in small pieces or portions. In the first case, the piece of liver must be cut into broad, flat slices with a width of about 1 cm. this should remove all veins, bile ducts, and fat. Sliced, put between two layers of cling film and lightly beat off, as in the preparation of the steak. To make it more convenient to just using the back side of a spoon. Use for pounding, a special hammer is not necessary, as the liver has a loose structure and does not require a strong mechanical processing. If you chop the liver into small pieces, to beat them is not necessary, just cut into wedges 1 cm thick, as well as in the first embodiment, thus removing cutting all unnecessary. Cut pieces of the liver can again a bit to soak it in milk. Then sprinkle them with seasonings or breading, depending on what recipe you will cook the dish. Salting raw liver can not be otherwise when frying, it will become hard. For breading, you can use flour mixed with pepper and other seasonings to taste, or a special mixture of rice crackers. The breading when frying is used for the dish was more succulent, but the liver can be cooked without it. Beef liver is a valuable and useful product. It belongs to the category of by-products and has a large set of useful properties. Beef liver can be cooked in a slow cooker, you can boil and make it into a paste, as you can fry in a pan. In the human diet must contain beef liver. In the liver quite a bit fat and a lot of vitamins. It contains vitamins a, B2, C, E, D and K. it also contains magnesium, sodium, calcium, potassium, phosphorus, iron, zinc, amino acids and antioxidants. The liver is an essential product in the diet of people leading an active lifestyle, or working in the intellectual sphere. Also, this product is useful for those who suffer from iron deficiency. However, liver should not be eaten for people with high cholesterol and suffering from cardiovascular diseases. When choosing of the liver pay attention to its color – fresh beef liver should be reddish brown. If the liver is too light, it means it is stale. The product must be smooth and homogeneous structure. It should be no impurities and veins. Also note the smell. The smell of fresh product should be sweet. The easiest way to cook beef liver – fry it. Prepares a dish very quickly. For cooking you will need to have in the kitchen the following ingredients: 1 kg beef liver, 2-3 onions, 1 Cup milk, salt and pepper, vegetable oil for frying. The first step is to flush the liver and cleanse it from the films. Then cut into slices or strips with a thickness of 0.5-1 cm cut pieces should be soaked in milk for 10 minutes. This is necessary in order to product the bitterness left. Onions can be cut into rings or strips. After soaking the liver can be spread into the pan. It must be oiled and warm. To the liver in a pan laid out the bow. Then, the ingredients need a little prozhat, and then add salt and pepper according to your taste. To cook liver is necessary on medium heat with the lid closed, stirring occasionally. The cooking time is 20-30 minutes. Salt the liver is necessary, after she gave the juice, otherwise the dish will turn out hard. If you see that the liver is not fried, you can pour a half glass of water or add 3-4 tablespoons of sour cream, then dish will have a soft and gentle taste. If you are cooking frozen liver, you should not thaw completely. It is better to cut slightly frozen slices, so the product will retain more nutrients.